Until recently, I thought I had a good working routine for lunch. If you ever came to see me at lunchtime, you’d find me hunkered over my keyboard, carrot sticks in hand. The lunch was healthy, and I saved about 20 minutes that I could later use however I’d like: starting dinner earlier; spending time with family; or getting an extra exercise session in after work. All was well with my theory until I read a study on the subject. 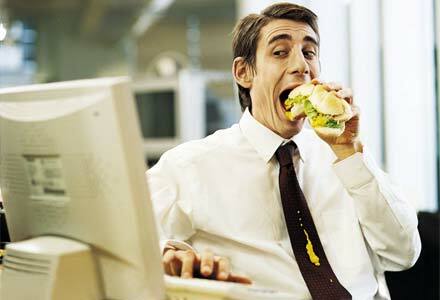 The study found that people who ate while working (or gaming) on the computer would later eat more than those who weren’t distracted by the computer during their meal. When we aren’t paying attention to what we’re eating, it’s as if the mind doesn’t register the meal and our stomachs end up grumbling too soon after. I knew it was time to change my habits. I think we all know that if we watch TV when we eat, we consume more calories. But this was the first study I read that showed how the effects of mindless eating can persist throughout the day. Book lunch with a friend. At least one day a week I get away from my desk to enjoy a good meal and great conversation. I resolve to eat at least part of my lunch away from my desk every single day. I might eat carrot sticks & hummus at my desk, but then I take the rest of my lunch to the break room and pray I run into someone! I take a green tea walk. I make a cup of tea, usually an hour before lunch, and then I come up with an excuse to go outside and enjoy the fresh air. I just wanted to say that this is one of the most enjoyable emails to receive in helping me be healthier. The info is useful, concise and easy to follow. Great little steps to wellness. Thanks! When my wife was teaching French to young kindergarten kids in Hawaii, she asked how many of them would sit down at the dinner table with their parents and enjoy sharing a good family dinner. Out of 30 kids only 2 raised their hands..the rest admitted laying down on the floor and eat whatever was put in front of them while watching TV or playing games. No wonder the grown up follow the same trend while working. At least for this one, the Europeans know better. Winner, winner. I love that your messages are so simple and short. This one is particularly applicable to many, if not most, of us who eat when and where we can squeeze it in. The computer factor is fascinating, yet not surprising. It’s easy to go catatonic on it. Kudos to you, Deborah, for reminding me that I’m not alone on this life — and eating — journey.